Today is the Higgs boson’s second birthday! It was on this day, the fourth of July, in 2012 that the Higgs was unveiled to the world with the now immortal words of CERN Director General, Rolf Heuer, “I think we have it”. Before the announcement was made, the atmosphere at CERN was like a rock concert. I, along with many PhD and summer students, spent the previous night waiting outside the auditorium where the talks from two of the LHC experiments, CMS and ATLAS, were to take place. This was to guarantee ourselves a seat to watch history being made. Waiting in the queue for a seat in the CERN auditorium where the discovery of a Higgs-like boson was about to be announced. It’s a shame that the room wasn’t larger as I know that many people were disappointed not to get a seat, especially if they had worked on the result, but I also think it’s fantastic that so many young people were able to be a part of it, as they will be the ones making the discoveries of the future. It was simultaneously streamed to other auditoriums in CERN, the ICHEP conference in Australia and online for the public to watch. Joe Incandela from the CMS experiment went first to explain their results. He was followed by ATLAS spokesperson, Fabiola Gianotti. Despite the importance of the results, many people on the internet didn’t like Fabiola’s choice of colours or font for her presentation and “comic sans” even started trending on twitter! It has now become a running joke at CERN, and there was even a video this April that CERN would be switching to the font. The presentations concluded with a a standing ovation! Standing ovation for the announcement by both CMS and ATLAS of a boson consistent with the Higgs! CERN, July 2012. After the announcement, the audience poured out to join the crowds of people outside. My group headed the short distance to R1, CERN’s premiere restaurant. We sat outside and toasted the discovery with champagne and Pimms provided by Steve Bieniek from Heathrow airport. After a while excitement turned to exhaustion and I lay my head on my arms to nap. I woke when a reporter from the Times came over: “I could tell you were British” he told us, “as I could see the bottle of Pimms from the other side of the courtyard”. He asked us questions about the announcement and what we thought it meant. It seemed that I was coherent enough, even though I had just woken up, to make it into the article! Although, unfortunately the article is behind a paywall. The next day the Higgs result was everywhere. It even made it onto the front page of the New York Times! The photograph included about four pixels of my head and I asked my American friends if someone could get a copy for me. It was brilliant how excited the world was about our discovery! On the day, I had seen Professor Higgs, along with the other major theorists, from a distance. A little over a year later I was able to meet him in person. In 2013, Prof. Higgs was given an honorary degree at the University of Manchester only days after the Nobel prize for physics had been announced. I had just submitted my thesis and so was more than happy to spend the day preparing for his arrival by building a LEGO version of the ATLAS detector. 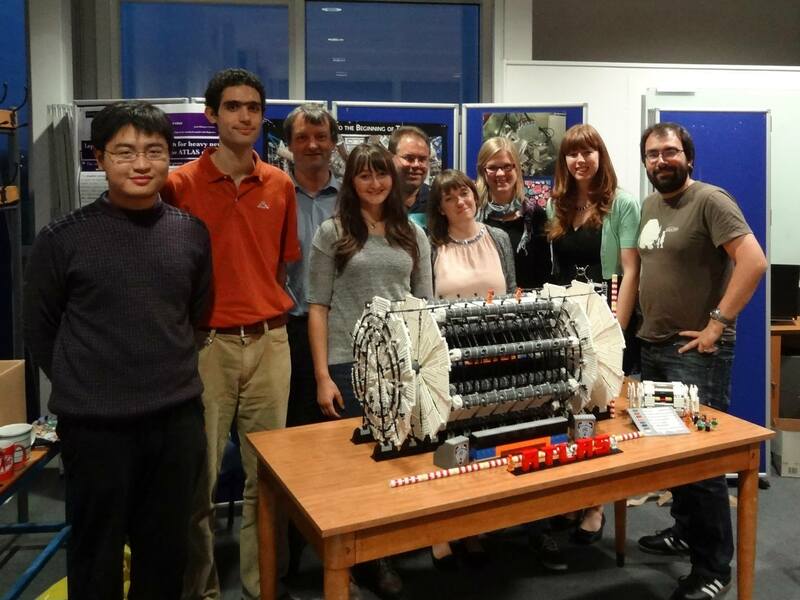 The team who rebuilt the ATLAS LEGO model at the University of Manchester. 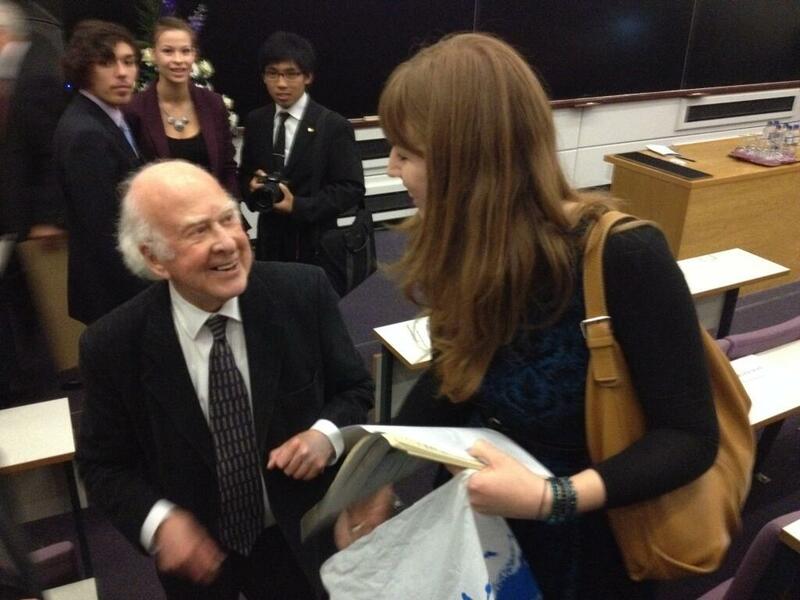 Prof. Higgs was modest and fascinating to listen to as he told us the history of the theory. I was very fortunate to be able to get my copy of the New York Times front page article of the boson discovery signed by him! 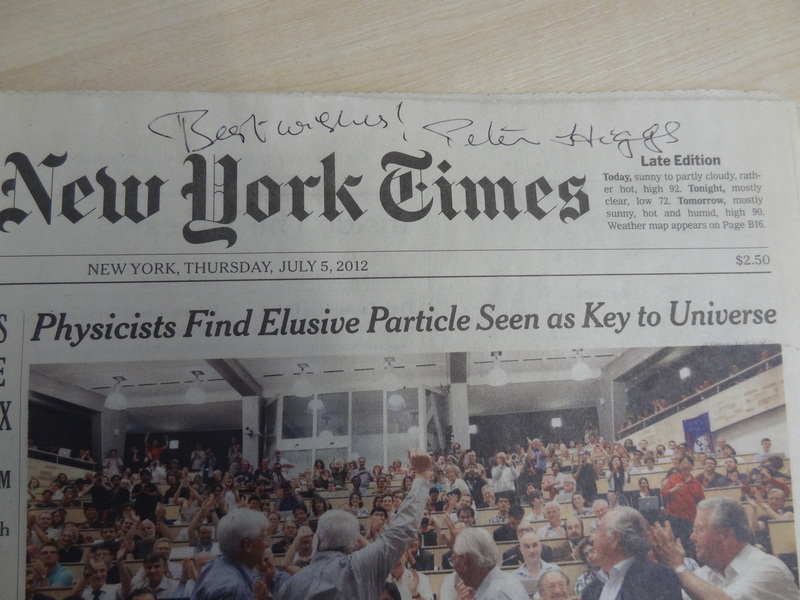 Signed copy of the front page of the New York Times from the day after the Higgs boson announcement, July 2012. If you look closely (and know where I was sitting) I can just be seen in the back of the auditorium! 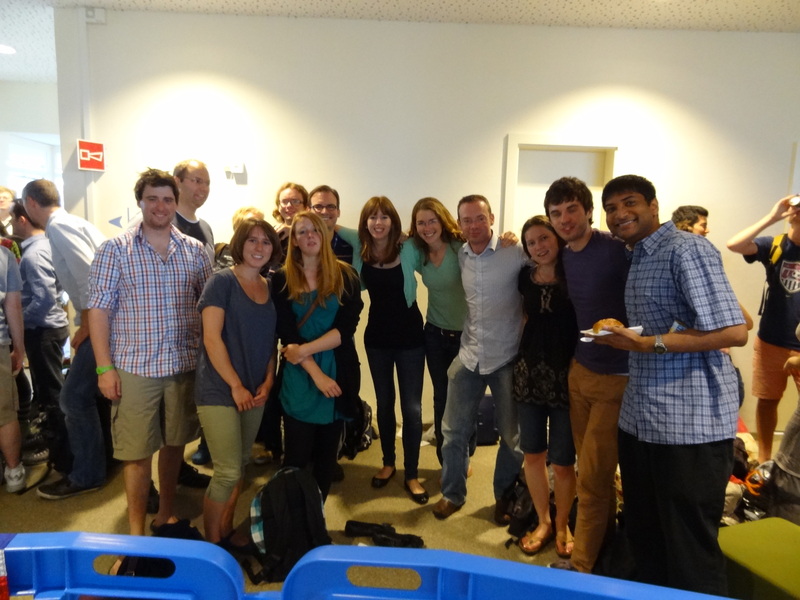 If you want to hear more about the Higgs boson (& beyond! ), and are near London this week, the Royal Society has a Summer Science Exhibition including a Higgs boson stall. Since Tuesday, scientists from universities all over the UK have been talking to the public about the Higgs boson, it’s discovery two years ago and what we still want to learn. You can follow the Twitter account for the exhibit @HiggsBosonRS14 to see photos and find out more information. If you visit on Saturday or Sunday afternoon, I’ll be on the stall, so please come over and say hello! Where were you when the Higgs boson discovery was announced? Did you watch online? Let me know in the comments below.